A quit claim deed form is a legal document used to transfer property between two or more people. Quit claim deeds are prepared by a GRANTOR – the person or persons transferring interest of a piece of property – and then signed over and assigned to a GRANTEE – the person receiving the property. Once signed and executed the GRANTOR “quits” his or her ownership or rights to the property, allowing the GRANTEE to assume those rights and the transfer of the property. Unlike a warranty deed, a quitclaim deed form does not provide the GRANTEE warranty on the title. A quit claim deed is most often used to transfer property between family members or assign property into a trust. Fill in and print a free quit claim deed form online in minutes. Quit claim deeds come in handy during divorce proceedings and are very useful if you need to transfer property quickly. You can also use a quit claim deed if you want to give property as a gift to someone. Take a look at our sample quit claim deed form below. You can click anywhere on the form to be taken directly to our free quit claim deed form or just click here to download a quit claim deed pdf. To fill out a quit claim deed, first you need to date the document and fill in the GRANTOR and GRANTEE names and addresses. Next, you need to add the address of the property that is to be transferred and a full description. 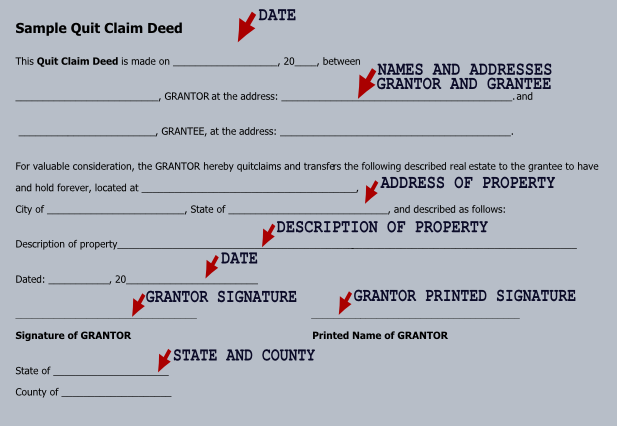 Then, you date the form again and the GRANTOR signs and prints his or her name in the space provided (note – this must be done in the presence of a notary). And, finally, there is a space to put your state and county where the quitclaim deed form is to be filed. That’s all there is to it – your part is done! The only thing left to do is to get the quit claim deed notarized. A warranty deed is used when transferring ownership of property between a buyer and seller. Warranty deeds guarantee that the seller owns the property and that the title is free and clear of all claims. A quit claim deed is also used to transfer ownership of property. However, there is no guarantee that their aren’t any liens against the property. With a quit claim deed, the owner of the property “quits” ownership and conveys his interest in the property to someone else. Quit claim deeds are most often used between family members when gifting property and during a divorce. Use a quit claim deed for fast transfer of property. Use a warranty deed when you buy property to make sure that the title is clear. Why is it Called a Quitclaim Deed? You may have heard the name called or saw it spelled quick claim deed form, quitclaim deed form, quit-claim deed form or quit claim deed form. 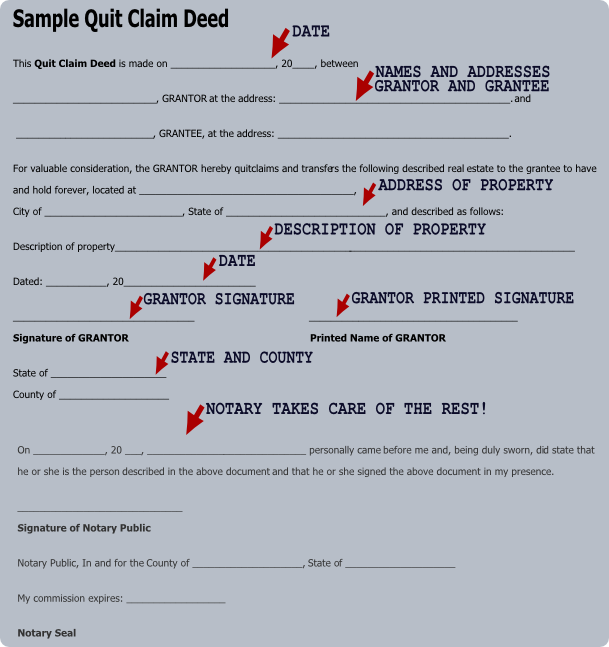 Fact is, all of the above names for quit claim deed are okay to use. Believe me, your county clerk will know what you want if you ask for a quick claim deed. However, the proper spelling of the document is quitclaim deed. It is called a quitclaim deed because that is exactly what it does – it quits any claim or right to a piece of property a person may have. Remove someone’s rights to the property during a divorce. Gift a piece of property to a family member or some other person. Buy or sell real estate with your business. Correct the way a name is spelled on a previous written deed. Transfer property into a trust. Clarify the ownership of property in a marriage and more. Do I Need a Lawyer to Fill Out a Quit Claim Deed? 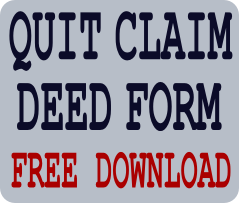 Fill out and print a free quit claim deed form in just minutes online.